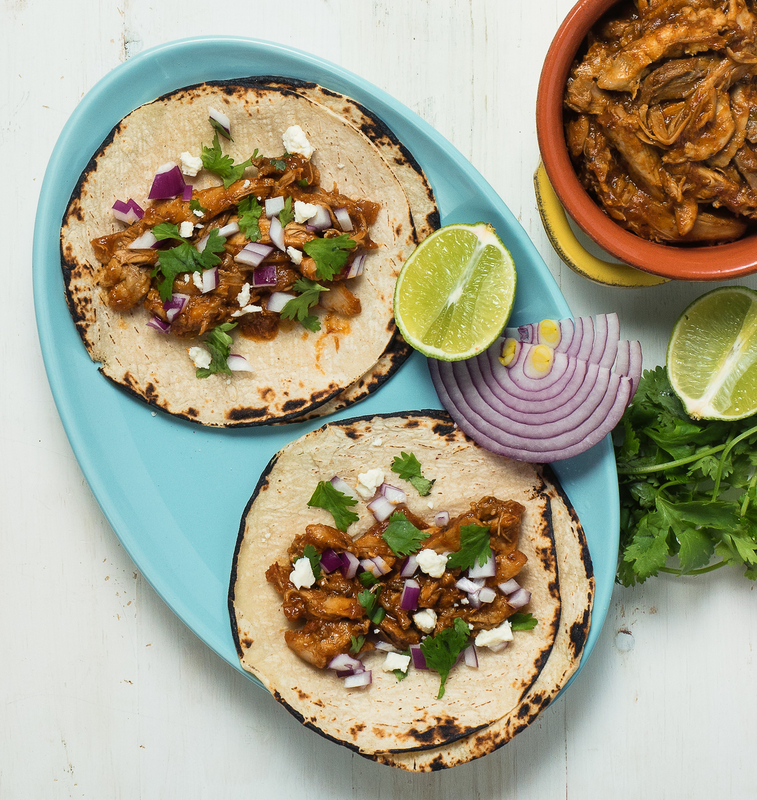 Chicken tinga tacos are a great alternative to carnitas or carne asada. It’s way easier to make as well. Takes way less time. Delicious though. Definitely tasty. Who needs another chicken taco recipe? Nobody. And yet I’m writing it. I’m doing it because I like tacos. But I’m also doing it because the world does need a better enchilada recipe. This recipe, along with this tomatillo salsa is laying the groundwork. Better restaurant style enchiladas verdes coming soon. 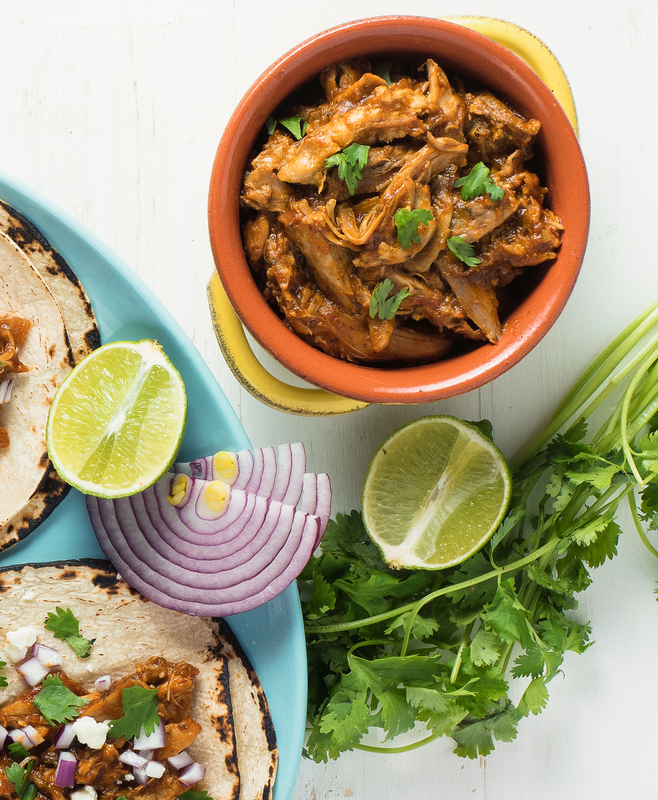 Tinga is a simple, shredded chicken dish with a red chili sauce. You know that tasteless shredded chicken you get at your local Mexican restaurant? This is what it’s supposed to taste like. Spicy, well seasoned and a little bit sour. Way better. You can use it to make chicken tinga tacos. Or enchiladas. Or quesadillas. Or you can just eat them straight from the pot. That’s what I do. 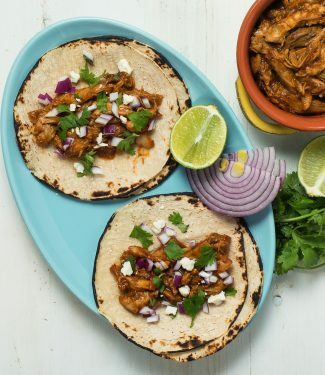 Chicken tinga tacos are a quick an easy alternative to carne asada or carnitas tacos. 1/2 tsp mexican oregano - leave it out if you can't get it. Oregano is not the same. Heat a pot that can hold the chicken in one layer over medium heat. Add the vegetable oil and cook, skin side down for about 4-5 minutes. Turn the chicken over and cook an additional 2 minutes. Remove chicken and set aside. Spoon off all but about 3 Tbsp of fat.You need this much because your spices will burn otherwise. Reduce heat to medium low and add the onion and garlic and cook until the onion is softened. Add the chili powder, cumin and oregano and cook 2 minutes. Watch to make sure the spices do not burn. Turn the heat back up to medium. Add the tomatoes and tomatillos and cook for about 3-4 minutes, stirring frequently. Watch that it doesn't dry out. Add the cider vinegar and cook a minute more. Return the chicken and accumulated juices. Add enough chicken stock to almost cover. Turn the chicken over and cook until an instant read thermometer reads 165F. This will take 5-10 minutes. Remove chicken and set aside. Turn the heat up to medium high and reduce by about half. Add the chipotle and adobo sauce and puree. If you are using a blender, take the thing in the middle of the lid off and cover with a towel. Unless you enjoy cleaning tomato sauce off the ceiling. Taste for salt at this point and adjust as required. When the chicken has cooled enough to handle, shred coarsely. Two forks works well here. Your hands work better. Combine the shredded chicken with the pureed sauce and warm over low heat. Wrap the tortillas in a dish towel, moisten with a little water and microwave them until hot. I know, it sound horrible but it does work. Rick Bayless says so. Place a bit of Tinga in the middle of a taco, top with onion and cilantro and sprinkle a little queso over top. In main course, mexican, poultry. Bookmark the permalink.